January 28, 2012 was the day I learned that my point and shoot camera has a long exposure mode. This brought the night sky much closer to home, and started me down a path I'd never imagined! Starting with just a point-and-shoot camera (I didn't even own a tripod), it's amazing to consider how my hobby has grown. Two years later, I own my own DSLR camera, I was given a small refractor from my grandpa, I have two EQ mounts, and a plethora of other accessories and gear. 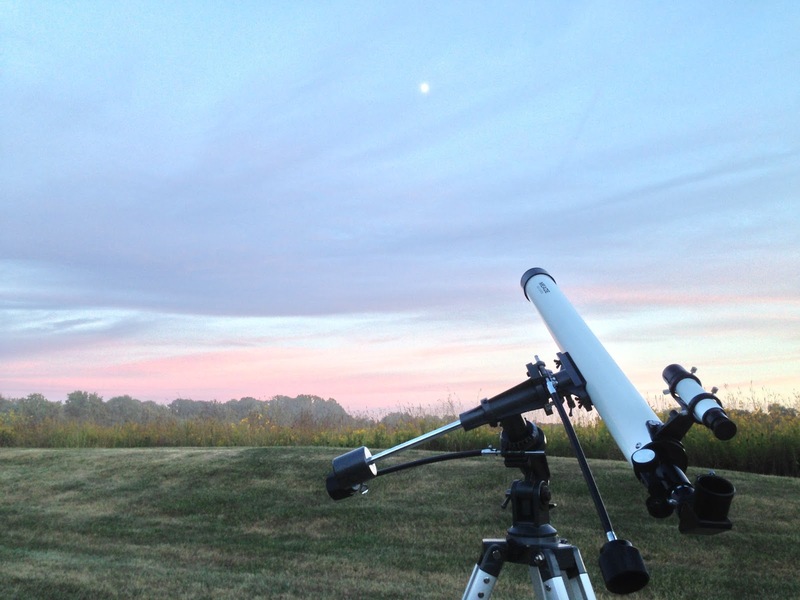 I joined the Indiana Astronomical Society, I attended 3 public stargazing events where I let girl scouts, cub scouts, and other interested community residents look at the moon through my telescope. I attended a number of lectures, and got to tour the Link Observatory. Just this morning I was contacted to have one of my photos published in a book! (More on that later I'm sure). As I did last year, I decided to post my best / favorite photos from the past year. These are the photos I'm most proud of, either because they represent new technical milestones, remind me of a particularly fun or challenging night, or just because I like them! Links to the original blog posts are included below to read more about the image or the story behind it. Conjunction of Mars and Mercury: I made a special trip out to the Slippery Elm Trail in the freezing cold just to spot this conjunction. It turned out very sci-fi looking. This image might appear in a book in the near future! First time using Registax: I remember being blown away by the improvement in sharpness when I learned how to stack moon photos. My workflow, and expectations for quality have never been the same! Point and Shoot Star Trails: Nothing too fancy with this one, just a stack of photos with my point-and-shoot camera back in Bowling Green. I left the camera out unattended on the back step behind the laundry room. I ended up framing an 8"x10" print of this for my office. Awesome Earthshine: I've photographed Earthshine before, but I stacked this one in Registax to clean up the dark side of the moon for more detail and less noise. I really like this image! 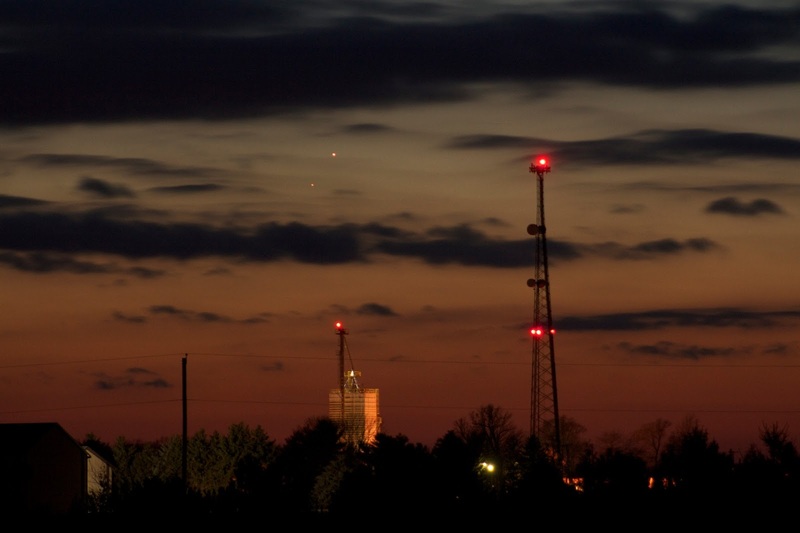 Comet PanSTARRS: I stayed out in the cold for 90 minutes waiting for sunset, scanning to try to find the comet, and staying around until it was very low to the horizon. It had been cloudy and rainy for days on either end of this partially cloudy night, and I'm pumped I decided to go out looking in spite of the less than ideal conditions. 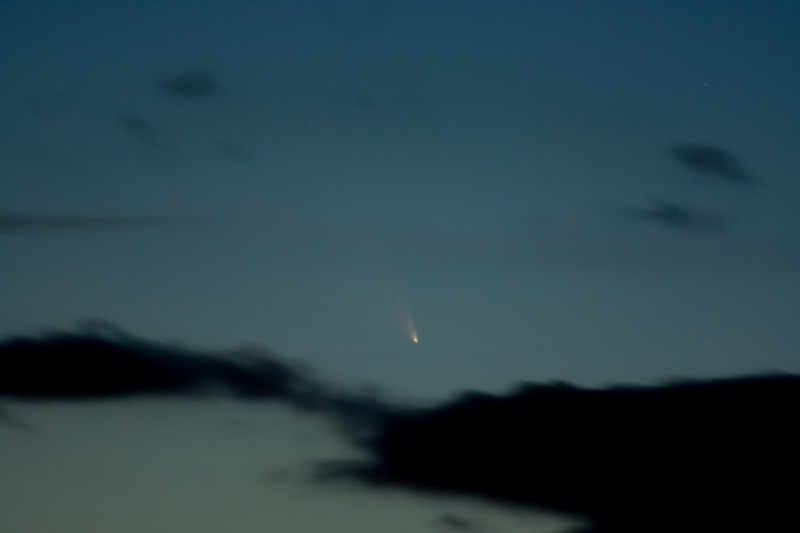 What a great comet! 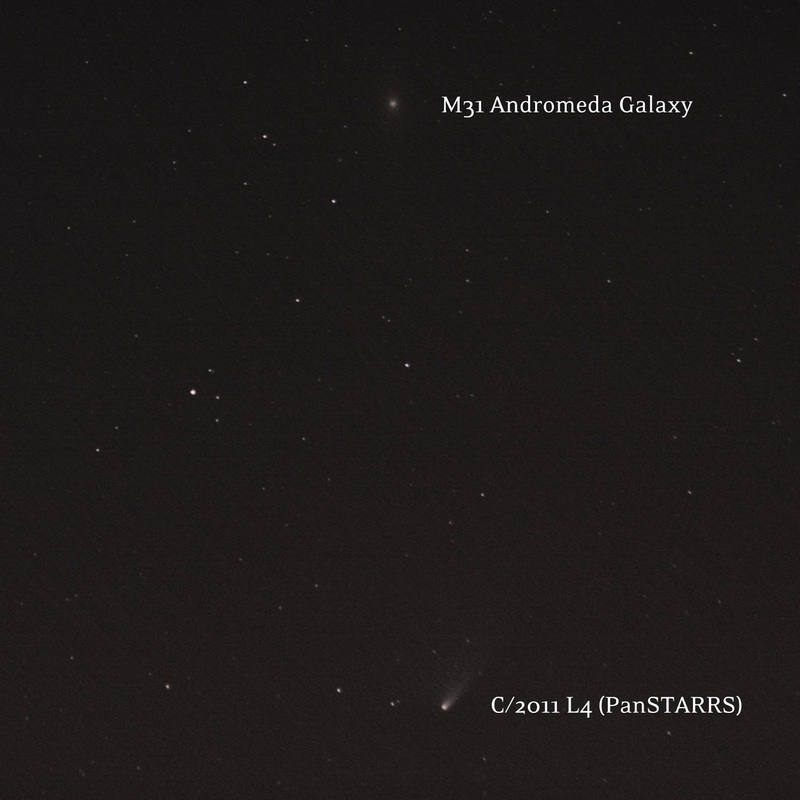 PanSTARRS Buzzes the Andromeda Galaxy: This image was a lot of fun to make! 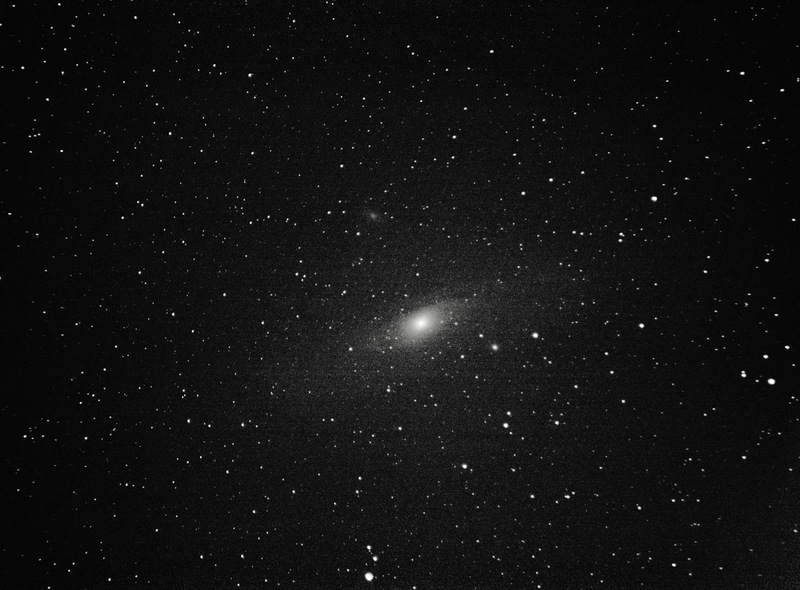 It combines a conjunction with a comet with deep sky stacking. It not only says a lot about what techniques I've learned over the past 2 years, but it's a rare and cool event that I remember fondly. Self Portrait: I took this photo on top of the hill at the Bowling Green golf course. It was a nice quiet spot, a little cold and muddy, but a fun change of pace for my typical locations. I did a series of self-portrait poses, and although it's a little cheesy I think it is a nice snapshot of me doing what I love. iPhone Gear: This photo reminds me of all the iPhone photography gear I got this year. It is also from the night I made a timelapse video of the moon and Jupiter setting over the BGSU Rec Center pond - which happens to be one of my better videos. Milky Way Wonder: This image is from my 3:30am spontaneous trip out to the Slippery Elm Trail to try to see the Milky Way before moving to Indy. It was after I already accepted my new job but before the move. I didn't realize how great the sky looked just a few minutes outside of Bowling Green. I wish I had gone more often, but at least I got a few good shots. 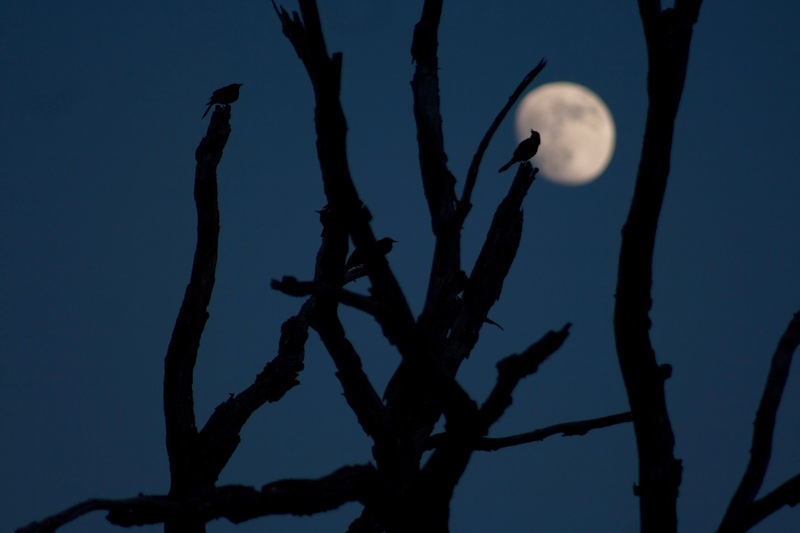 Bird Silhouette: I love this photo! I have always liked the dead tree across the street from my apartment in Brownsburg, so when I saw about 50 birds in the tree at dusk I ran across the street to get a few shots. It turned out better than I planned. I also have this print framed in my office! 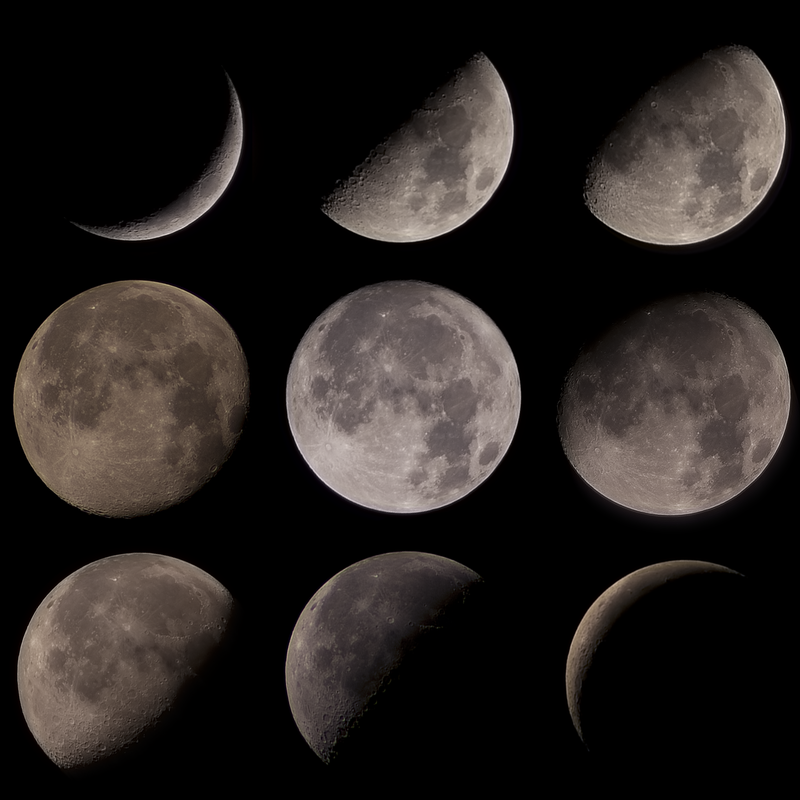 Moonsterpiece Moon Phase Composite: It took me from February to June to collect these moon phases, and I had to go out at all hours of the night. I'm very proud of this collection, but now that I have a better camera I feel like I should do it all over again! 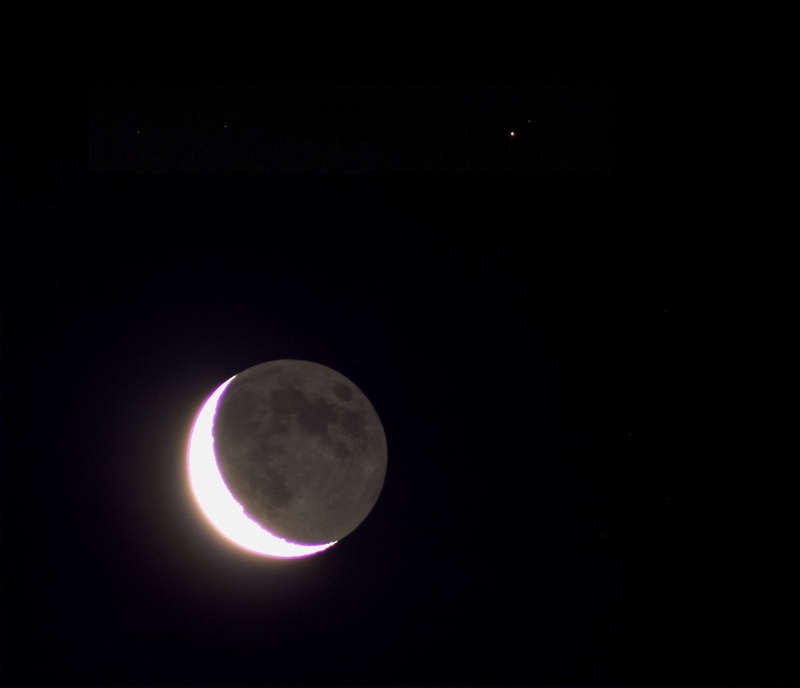 I like that they're not all the same color, it shows more variety in the moon's appearance. The Original Yoda Puppet: Chris and I went to the Star Wars exhibit at the Indiana State Museum, and I liked it so much I went back with my sister a few weeks later. 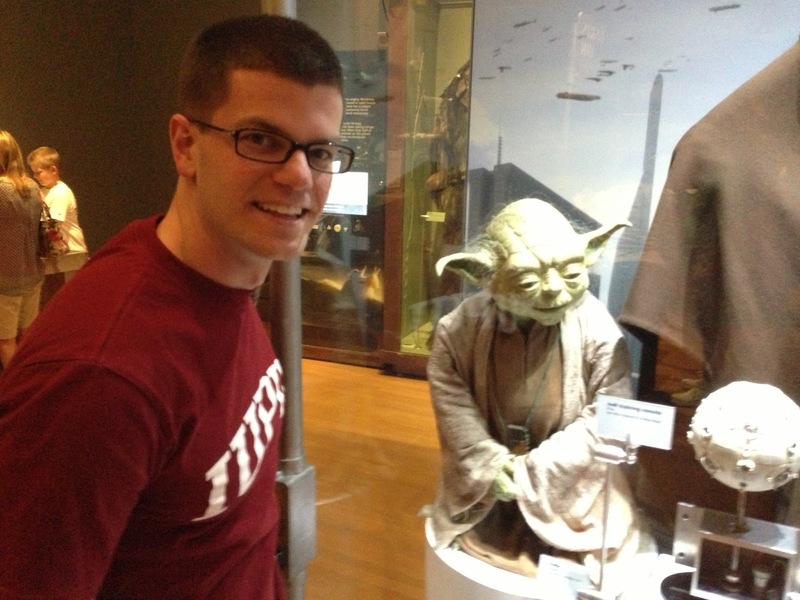 My favorite piece in the exhibit was the original Yoda puppet! So cool! I know this isn't night sky related, but it's nerdy enough to qualify. iPhone Light Trails: Nothing too technically impressive about this one, just a happy accident that turned out cool. It also reminds me of my other light trail attempts - that stuff is harder than it looks! Messier Trio: I really like this image of the Trifid Nebula, the Lagoon Nebula, and M21. It reminds me of checking many Messier Objects off my list this past year. 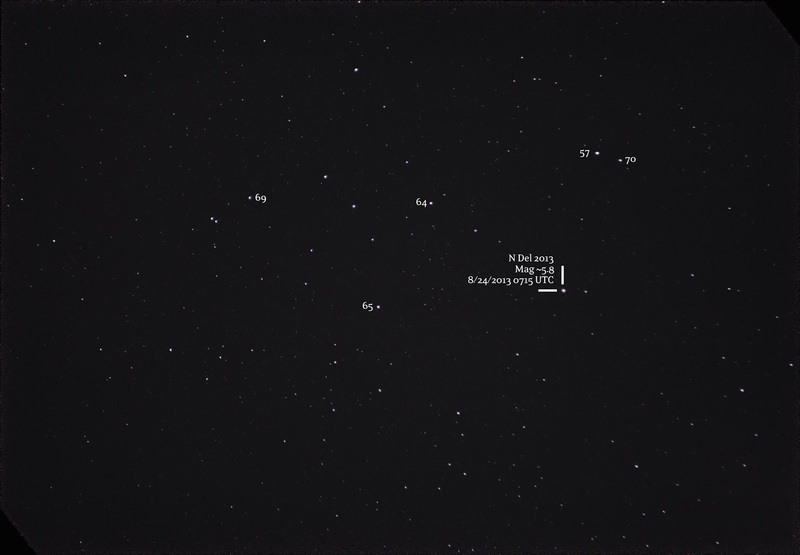 It also helped me realize I can photograph more of the deep sky than just the Orion Nebula. 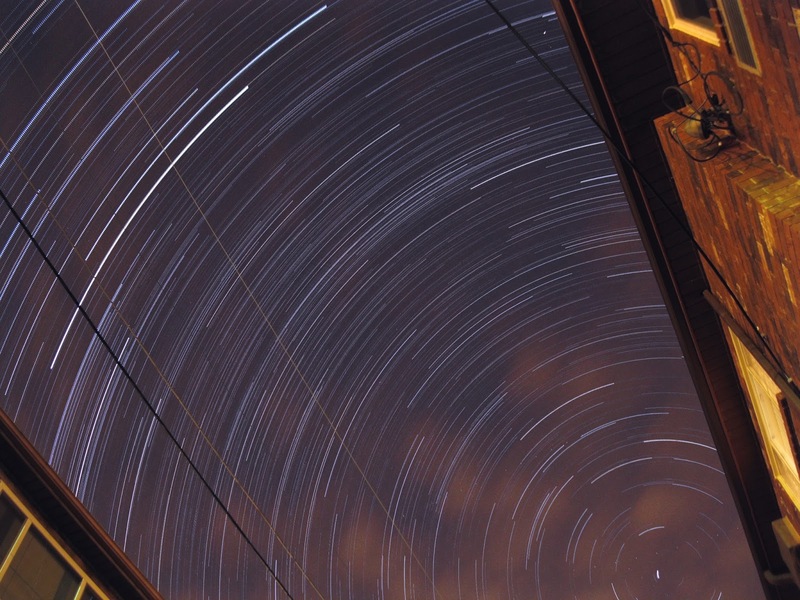 I think this image represents a lot of my technical improvement with deep sky stacking. Balcony Sunset: I love having a 2nd floor balcony on my apartment. 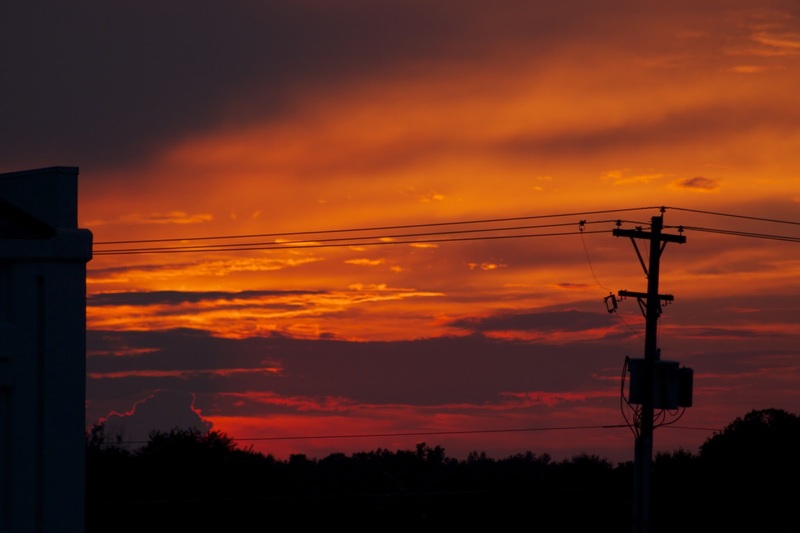 This image reminds me of all the great sunsets over the year, and all the good use I get out of the balcony. I love leaving the blinds open so I can see the sky conditions during the golden hour. I love a totally clear sky at dusk with a summer breeze. 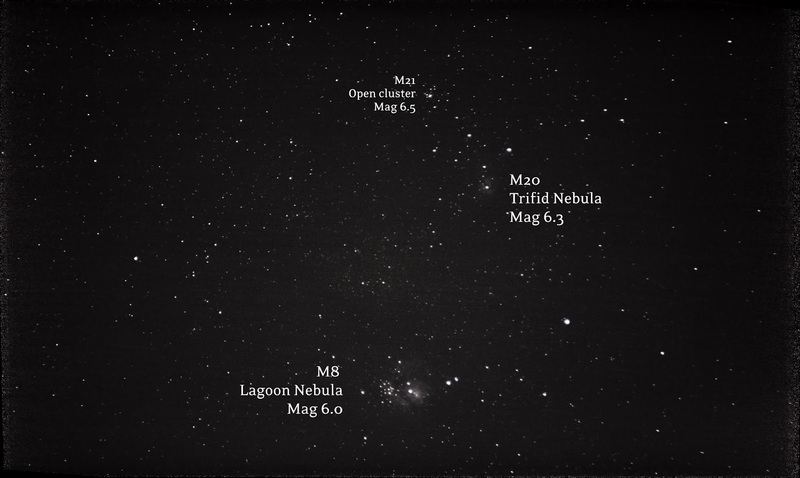 Nova Del 2013: This August event taught me a lot about star magnitudes, star hopping to find new locations, and about how stars work in general. It really forced me to learn more, and I remember being excited when I finally located this one. 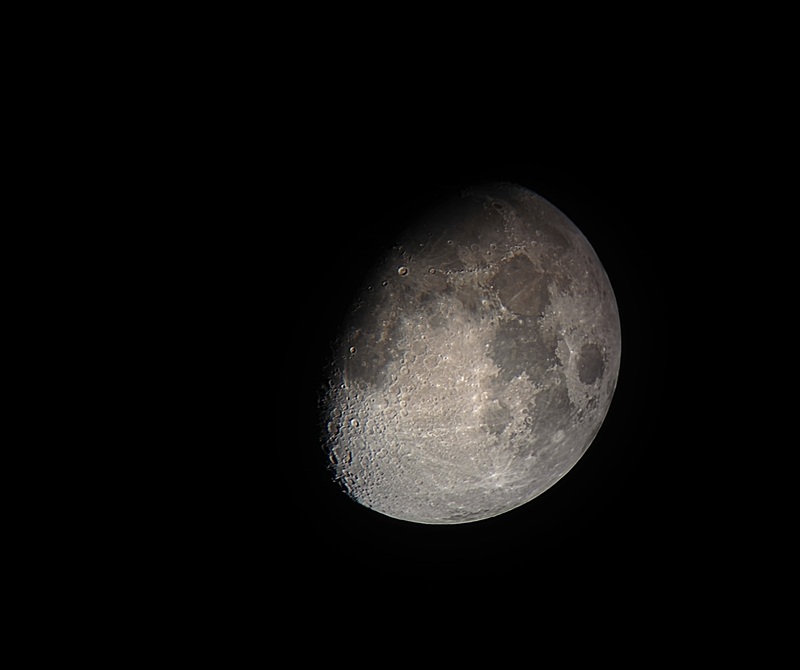 Moon Silhouette: This image took several nights and a lot of patients to get! 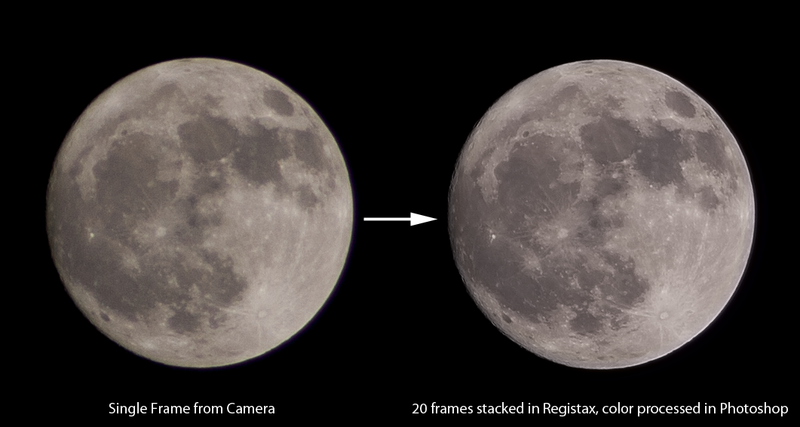 It was a fun little challenge, and forced me to learn more about the apps I use to predict the moon's location. It also taught me that although luck comes in handy, a little intentional planning goes a long way too. 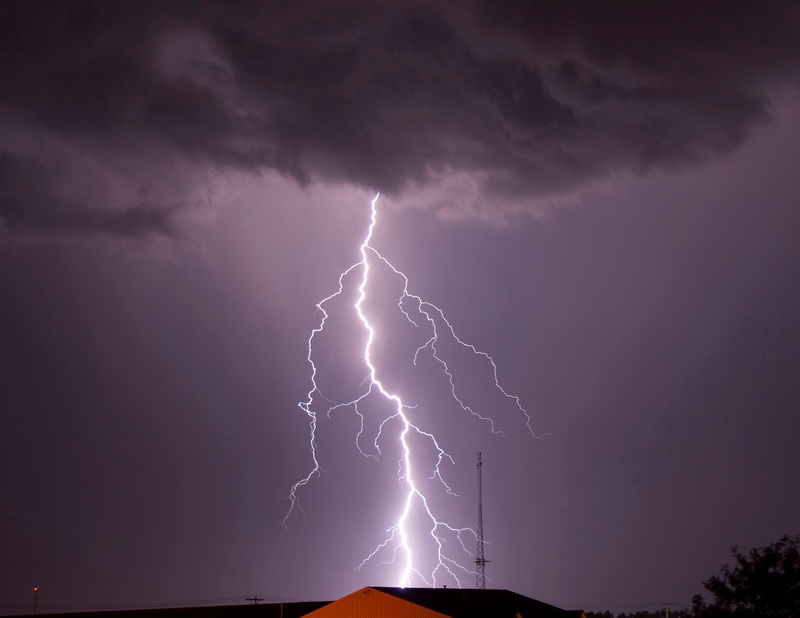 Epic Lightning: Are you freaking kidding me? Who knew I was even capable of getting a shot like this. This has been my iPhone wallpaper since the day I took the photo. This photo makes me take a step back and realize I'm getting better at my hobby. Eric from 2 years ago could never have gotten this. 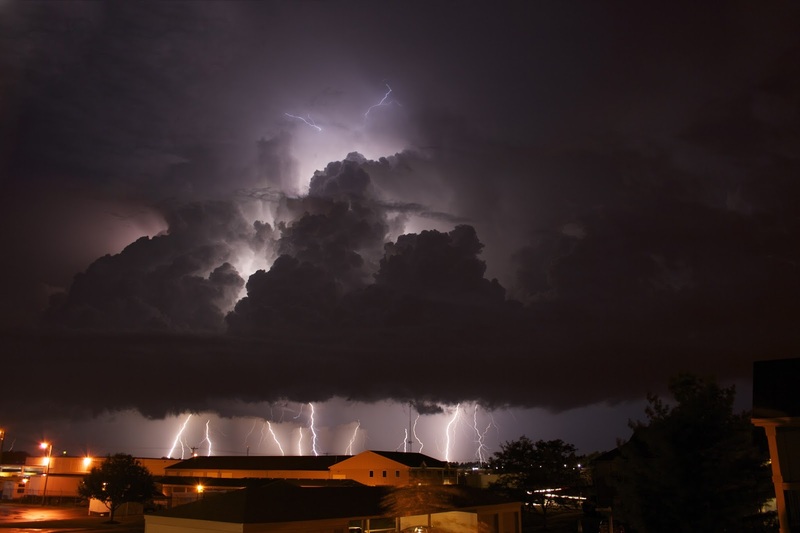 Monster Lightning: My decision to stack my lightning photos on that perfect night paid off big time. Wow! Stuff like this makes me feel like a real photographer. Personal Best Andromeda: I decided if I was gonna do Andromeda again that I would do it right. 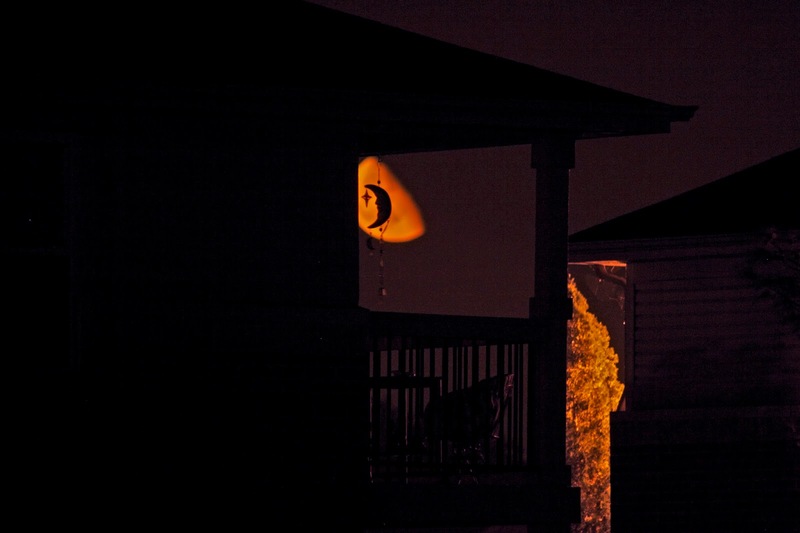 This image is the result of two nights of shooting and 3 full memory cards. A whopping 534 light frames! I can't wait to leave this image in the dust when I finally get out there with my new camera on an EQ mount - but it's nice to have a 'best attempt' using this gear and technique. McCloud Nature Preserve: This park sure lived up to it's name, with thin clouds all 3 times I went out. It was a fun way to get to know some of the guys from IAS, and helped me realize I know a good bit about the moon! 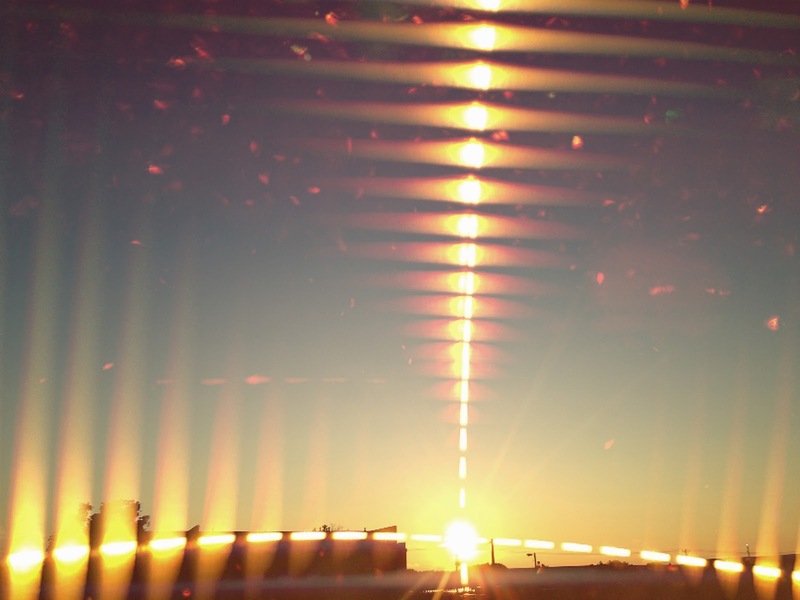 I was able to describe the apparent motion of the sky to people from the community who came out. I had a line of 10 girl scouts at my telescope at one point! I can't wait to go back when it's warmer. 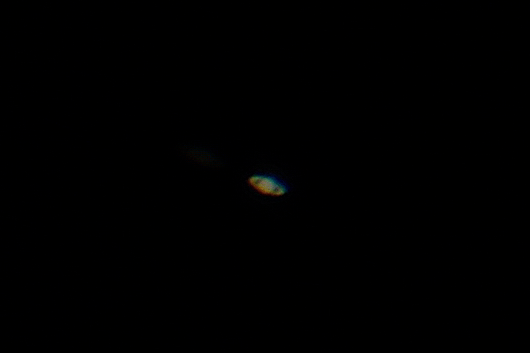 Saturn from iPhone Video: File this one under "I didn't know my gear could do that!" 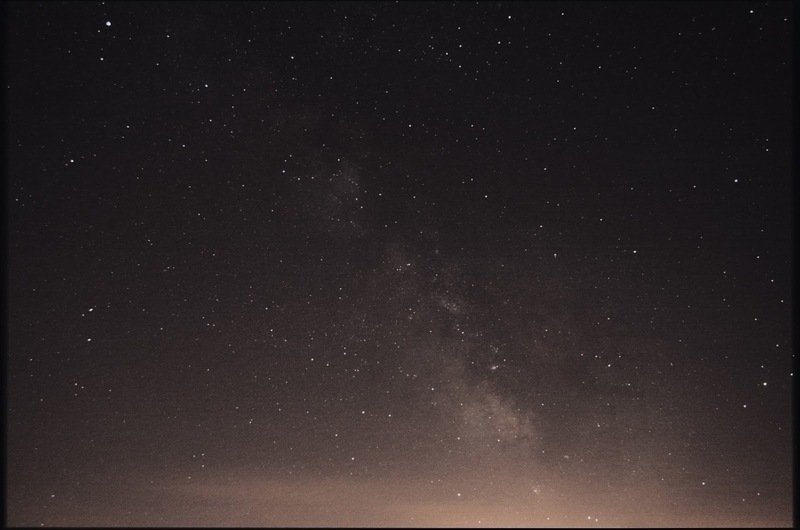 It was quite the ordeal to figure out how to get iPhone videos to load in Registax - but after a few days I was able to pull it off and it was worth it. It's Saturn! I took a recognizable image of Saturn! Wow! 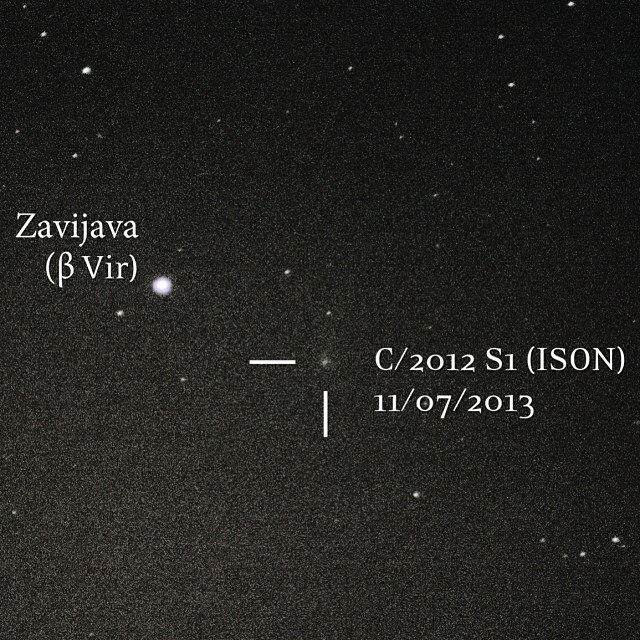 Comet ISON: This was the anti-climactic story of the year, and I'm pleased I was able to snag a photo of the bugger before it broke up around the sun. It's not a great photo, but it's a famous object, so I think it sorta evens out. 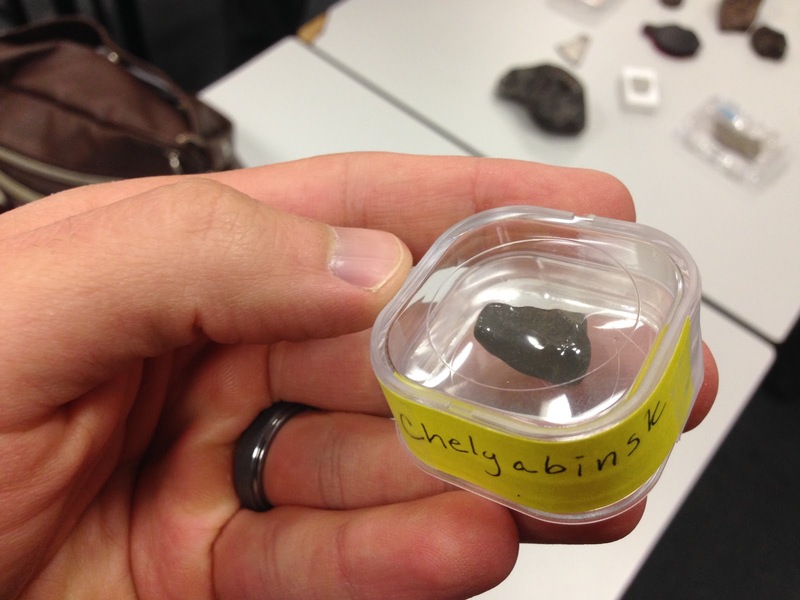 Chelyabinsk Meteorite: I attended an IAS lecture at Butler University and got to get hands on with some meteorites! iPhone Moon: My DIY iPhone telescope adapter paid off with this great image made from stacking a video of the moon. I had an idea, got to build things with my hands, and had it ultimately work out. I felt so crafty! Lunar Halo Redemption: After not really catching the last lunar halo I saw, I was pumped this one showed up on camera. 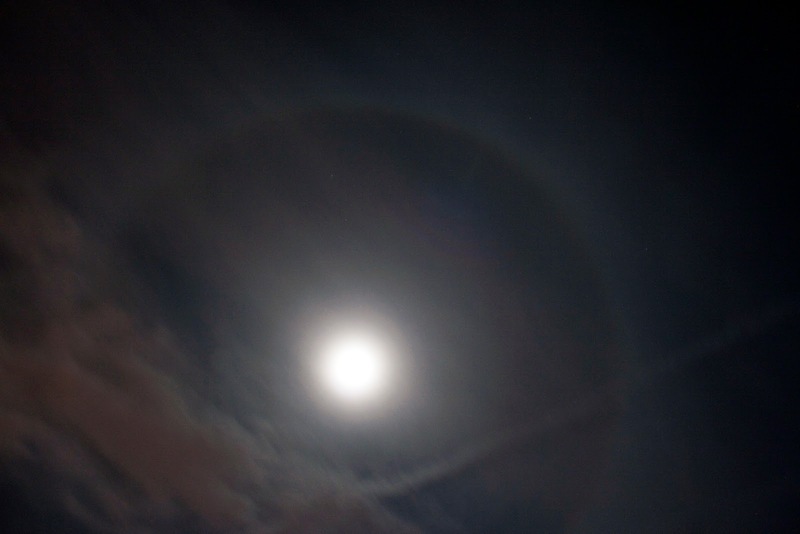 It was my second lunar halo and first 'real' photo of one. 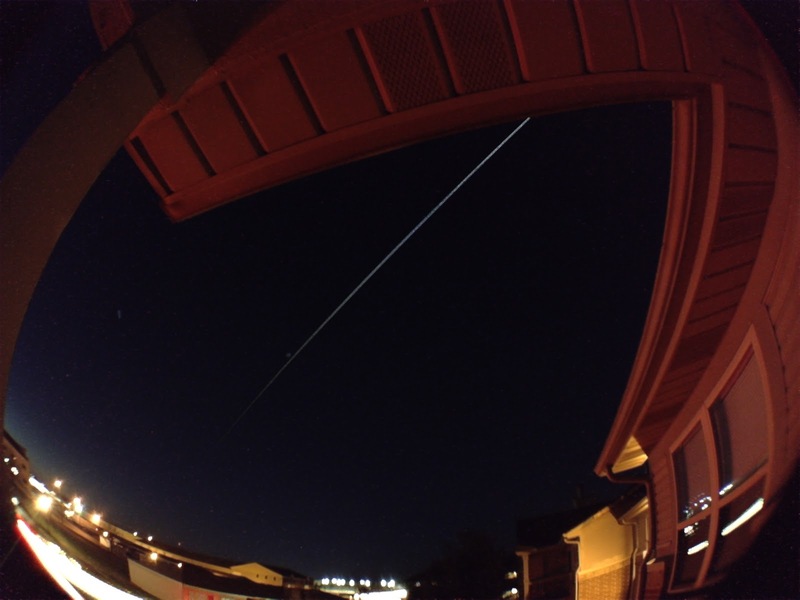 iPhone ISS Pass: I've done a lot of ISS watching from my balcony. I prefer to do it in the summer with a glass of wine, but this shot from December was worth sticking it out in the cold to use my fish eye lens. Geminid Meteors: The Geminids was the first shower I tried to photograph last year and I turned up with one likely candidate. 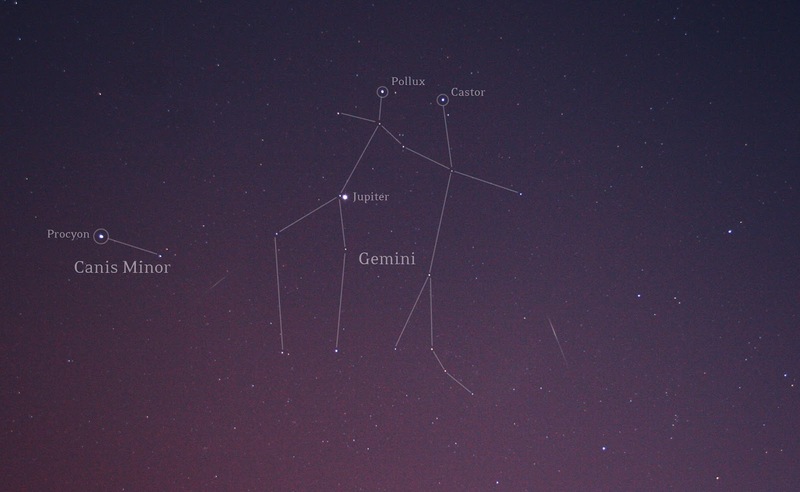 This year, I caught 2 obvious Geminids. I put my camera out at 3:30am after getting back from The Hobbit movie premiere - when all I wanted to do was climb into bed - I'm glad I mustered the energy to set up my gear because I came away with one of my favorite composite images of the year! 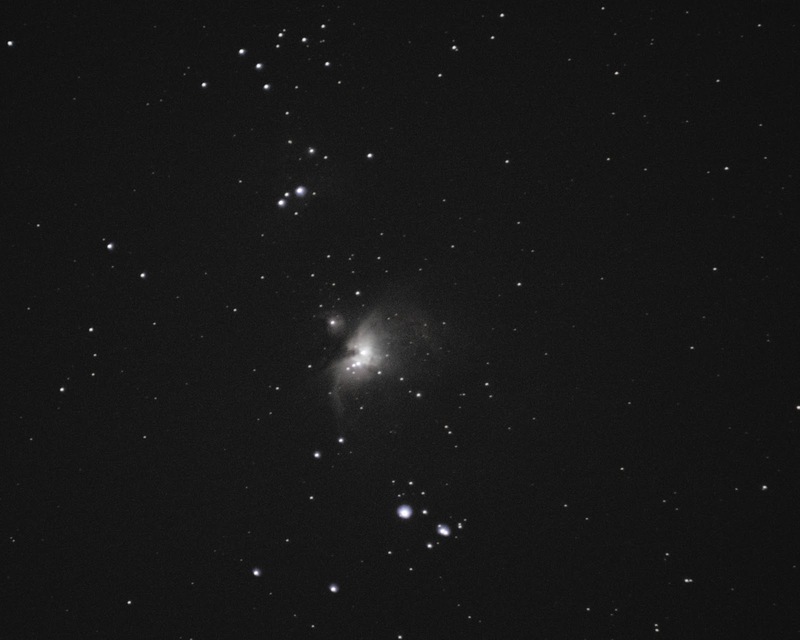 New Personal Best Orion: I made this image with just 42 light frames from my new camera. It's exciting to think what I'll be able to do when I get the mount going. 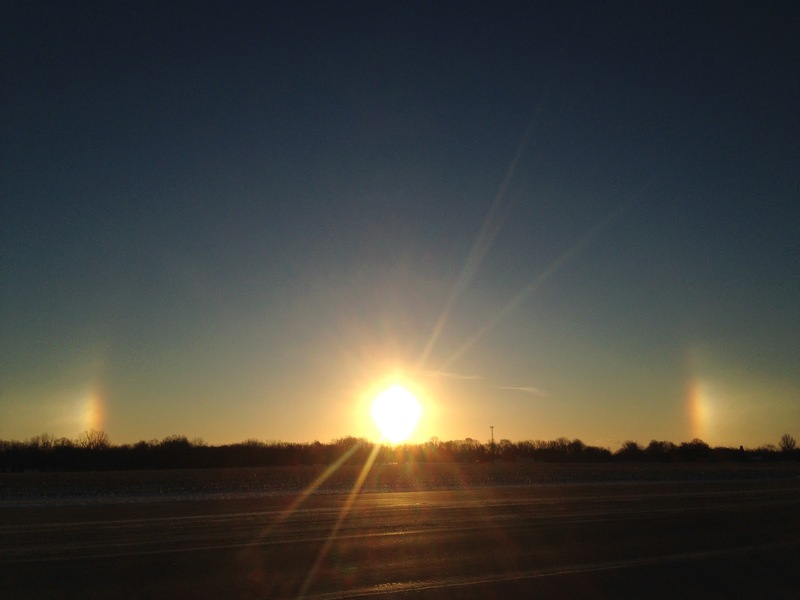 My First Sundog: This is a great example of why it's awesome to have my iPhone camera always handy - and it reminds me that it's worth it to pull over on the side of the road if you see something cool!